"One morning, Jakob informed his wife, Elsie, that he had had a dream. What kind? she wanted to know. God, he explained, had asked him to buy two donkeys. His wife objected that their budget for obeying divine commands received in dreams was limited. But Jakob von Staden did the Lord's bidding. He borrowed money, acquired two donkeys, built a cart out of old boards and junk, hitched the donkeys to it, and asked some passing tourists if they wanted a tour of his village or his township. Jakob's donkey cart tours have been a highlight of Nieu-Bethesda ever since. The town in the Great Karoo, near the Sneeuberg Mountains and far from the usual tourist routes, has a legendary reputation as an artists' colony. Every year thousands of travellers make the pilgrimage to see the eerie "owl house," The artist Helen Martins worked for decades up until she died, at turning her home and garden into a unified artwork of spiritual significance. The countless cement sculptures of owls and caravans of camels were inspired by religions and cultures from around the world. Today her house is open to the public. Jakob now has six donkeys and two donkey carts, Sometimes a coach as well, for the brides and grooms he escorts to weddings and candlelight dinners at the Ganora Guest Farm. Sheep producer Jan-Peet Steynberg found his personal paradise there several years ago. The Karoo has strict rules for farmers like him: one sheep per hectare, around two and a half acres. The semi-arid landscape can give nothing more. Except when its stones begin to speak. J.P. is an enthusiastic amateur- paleontologist. His seven-thoussnd-hectare ranch is home to fossils hundreds of millions of years old. When Jakob brings him new guests, he likes to tell them, "Give me a day, and l'll give you two hundred and fifty million years. 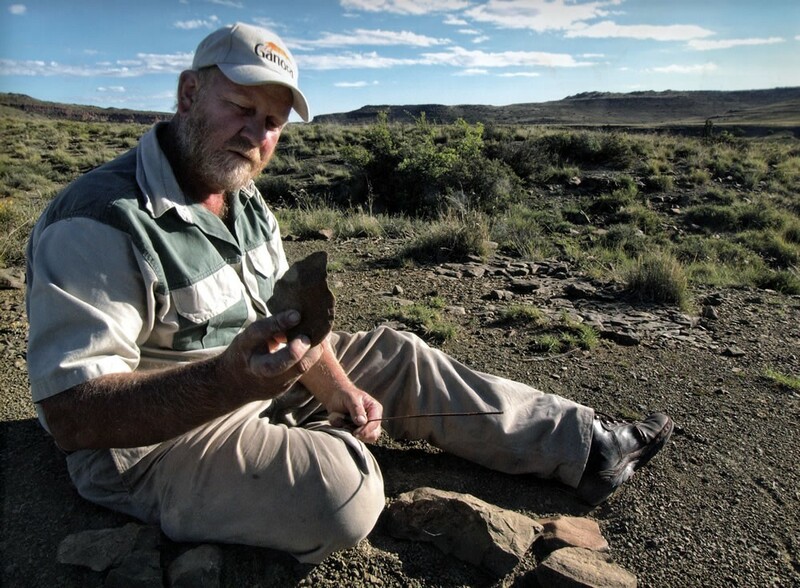 His walks across the bone-dry plains regularly turn up new fossils. The ranch hands roll their eyes and remark that the rocks are talking to the boss again. Out here in the middle of nowhere, Jakob, J.P., and their neighbours can almost feel the weight of the sky. “Look at those stars” Jakob says, pointing upward. "you're not close to heaven here. You’re already there!"